Most cases of neck pain originate from strain and can be treated non-surgically. Helping the patient through the acute phase addresses breaking the pain cycle. This involves relieving neck pressure and muscle spasm. Cervical collars limit movement and support the head taking the load off the neck. Lying down has a similar affect. Limiting neck movement and reducing pressure (weight) gives muscles needed rest while healing. Cervical traction may be prescribed for home use. This form of traction gently pulls the head, stretching neck muscles while increasing the size of the neural passageways (foramen). 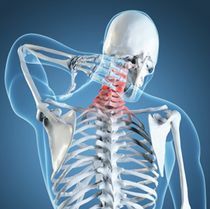 Depending on the cause of the neck pain, non-steroidal anti-inflammatory drugs (NSAIDs), muscle relaxants, and/or short-term use of narcotics may be prescribed. In some cases trigger point injections are beneficial. Often Physical Therapy (PT) is incorporated into the treatment plan. Passive forms of PT such as heat/cold, ultrasound, and massage may help alleviate pain and stiffness. Therapeutic exercise can help build strength and increase range of motion. Therapists also educate the patient about their condition and teach posture correction and relaxation techniques. Seldom does neck pain require surgical intervention. Indications for surgery include, but are not limited to spinal cord dysfunction, excruciating pain unrelieved by conservative measures, and prolonged pain and/or weakness. For example, a vertebral fracture or herniated disc may cause spinal cord compression resulting in serious neurologic deficit. Spinal stenosis, a narrowing of the foramen or neural passageways, may entrap nerve roots that may cause unrelenting pain. The type of surgical procedure is dependent on the patient's needs. The surgeon considers the patient's medical history, age, general physical condition, occupation, and other factors. Cervical spinal surgery is delicate and requires a skilled surgeon. Following doctor's/physical therapist's orders along with time are often all that is needed to overcome neck pain. Whether neck pain is treated with or without surgery, eating properly, regular exercise, and weight maintenance help healing and benefit spinal health. For patients who undergo a surgical procedure the road to recovery may be a bit longer. However, that is not reason to become discouraged. It is normal to feel tired and emotionally down following surgery. During stress such as surgery, the body cranks out extra hormones - after surgery the level drops, which may result in a 'down' period. Prevention can be a key to avoiding neck pain in the future. Remember the neck - although very mobile, it has limitations. Avoid activities that cause the neck to hyperflex or hyperextend, maintain good posture, and take frequent stretch breaks from desk/computer work. Incorporate neck safety into your activities of work and play.